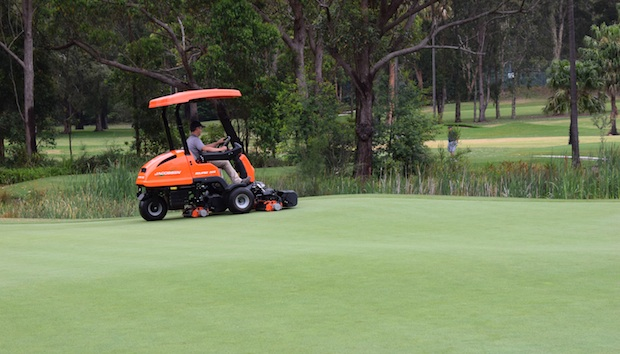 Cromer Golf Club, located on Sydney’s Northern Beaches, has combatted regular noise complaints from local residents by investing in an all-electric Jacobsen Eclipse 322 greens mower. “I was getting phone calls at least once a week from residents who were not happy with being woken up early due to the noise that our machinery was creating. I can understand their frustration to an extent, so with the club’s backing I decided it was time to do something about it. “I did some research, and came across the Jacobsen Eclipse 322. After seeing it in action, I knew that it was the machine we needed. It is such a quiet mower, which means that I can now be more effective with my mowing route, as I don’t need to worry about waking anyone up! Cromer Golf Club uses the 15-blade variant of the Eclipse 322, which also features electrically adjustable cutting frequencies and mow and transport speeds. The innovative machine does not use hydraulic oil, thus eliminating the chance of leaks. A Hybrid variant of the Eclipse 322 is also available. “Our local dealer JT Turf has been brilliant. The machine arrived on time and as expected, and I am confident that if we ever needed technical support, our dealer would be with us straight away to help us out.